Did you know your hot tub cover is the key to the efficiency of your hot tub heating costs? If you don’t want to waste money on heating and maintaining a consistent temperature, you need to make sure you have the right hot tub cover. In Alberta, the weather can make efficient heating a struggle. 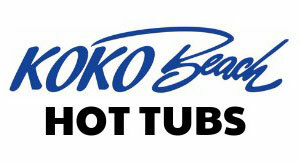 That’s why at Koko Beach Hot Tubs, our covers are durable, strong, and attractive. 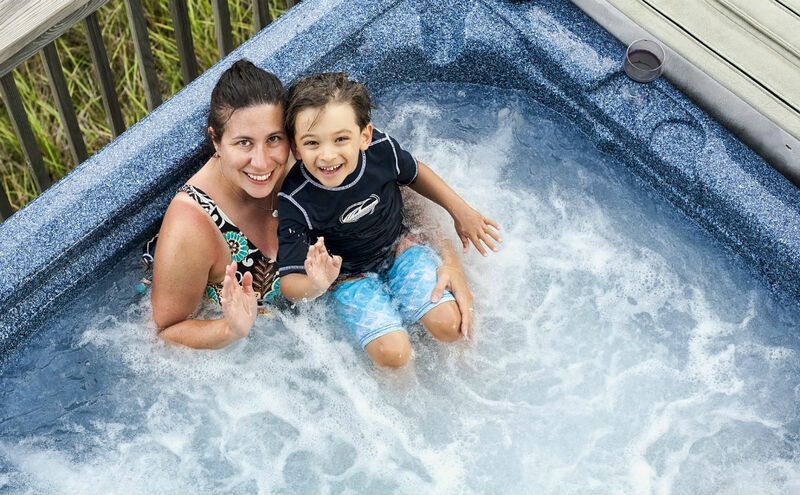 Proudly manufactured in Canada, what sets our hot tub covers apart is the high-quality materials used to withstand the harsh Canadian climate. Contact us or fill out our cover order form to get the perfect hot tub cover in Alberta today! Please note that the colours pictured on this page are very close representations of the choices in our line. However they may not be exact. No returns will be accepted due to colour variance. Measure the spa – not the original cover. Covers can warp, stretch or shrink throughout the years and will not provide as reliable of a measurement as the spa itself. If you’re not 100% sure on the size you need, remember that a slightly oversized cover is always better than a slightly undersized cover. Decide whether you want to cover just the acrylic shell of your spa, or if you would like to cover the wood lip as well. 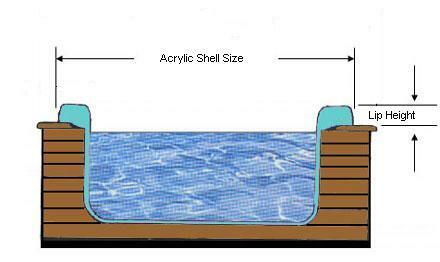 If you want to cover the wood lip, please make sure you measure the height of the acrylic shell too. Decide which way you want the cover to fold. The dotted lines found in the diagrams on the order sheet will indicate the hinge direction. Make sure to take this into account when entering the spa’s “A” and “B” dimensions. There are additional considerations to be made if you are ordering a cover with rounded corners. Be sure to measure all corners to determine if they are all the same size (note: a slightly smaller radius will slightly overhang the spa while a larger radius will not cover the spa completely). 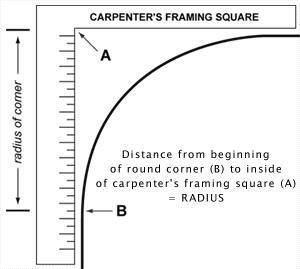 One method of determining a spa’s corner radius is to use a carpenter’s framing square. Hold it up against the corner of the spa as you see in the diagram. The radius of the corner is the distance between “A” and “B”. Alternatively, it is acceptable to place a sheet of white 8 x 11 paper over the top of the corner, draw a line (tracing) of the corner, and fax it along with the order sheet. Some covers have cut corners. 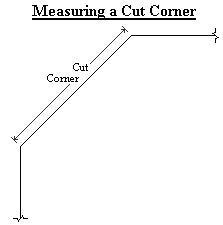 The diagram shows the measurement required for the cut corner. Be sure to measure all corners and that they are all the same size (note: a slightly smaller cut-corner will cause the cover to slightly overhang the spa while a larger cut-corner will not cover the spa completely). 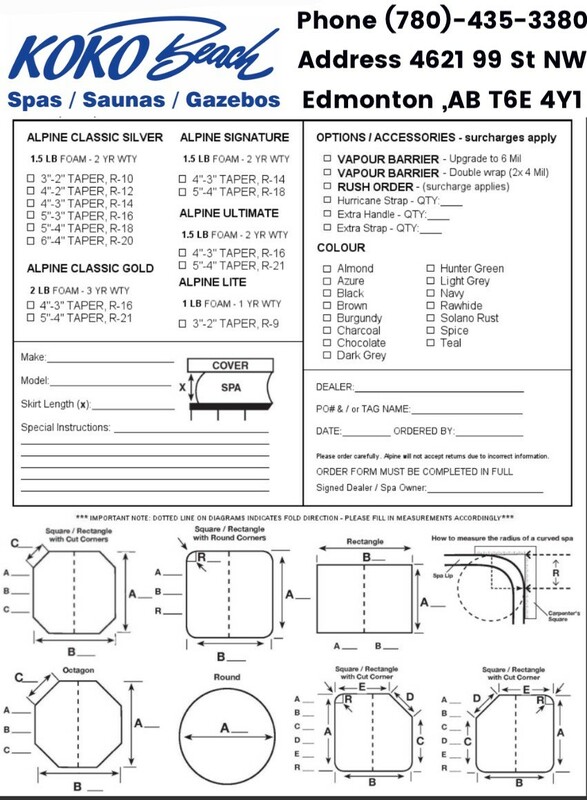 To start your ordering process, print off our cover order form, fill it out and mail it in or drop it off at our convenient Edmonton location. Choose from our wide range of hot tub covers in various colours to suit your preference.